With the Supreme Court reluctant to take sides in the battle between TV networks and steaming provider Aereo, the biggest news to come out of yesterday’s oral arguments was just how clueless some of the justices appeared. Septuagenarian Antonin Scalia provided the line of the day when he seemed befuddled at the idea that HBO isn’t available over the air. Other moments of confused tech talk included Sonia Sotomayor dismantling the cred attained by owning a Roku when she asked a lawyer to talk about “iDrop in the cloud.” Oof. “The court hasn’t really ‘gotten to’ email.” – Elena Kagan admitting that justices still communicate by writing memos on ivory paper. “Maybe everybody else knows this, but what is the difference between the pager and the email?” – John Roberts asking a question that wasn’t as stupid as it sounds. “Does it say: ‘Your call is important to us, and we will get back to you?’” – Anthony Kennedy asking what happens when a text is received at the same time another is sent. “Well, I didn’t — I wouldn’t think that. I thought, you know, you push a button, it goes right to the other thing.” – John Roberts realizing that texts are routed through a service provider. “Could Quon print these spicy little conversations and send them to his buddies?” – Antonin Scalia inquiring on the possibility of printing text messages. “V-chips won’t work?” – Anthony Kennedy wondering if TV technology can be used to censor violent video games. “If I’m applying the First Amendment, I have to apply it to a world where there’s an internet, and there’s Facebook. And there are movies like The Social Network, which I couldn’t even understand.” – Stephen Breyer admitting his distaste for Aaron Sorkin. “I mean, what kind of a narcissistic society is it that ­people want to put out there, This is my life, and this is what I did yesterday? I mean … good grief. Doesn’t that strike you as strange? 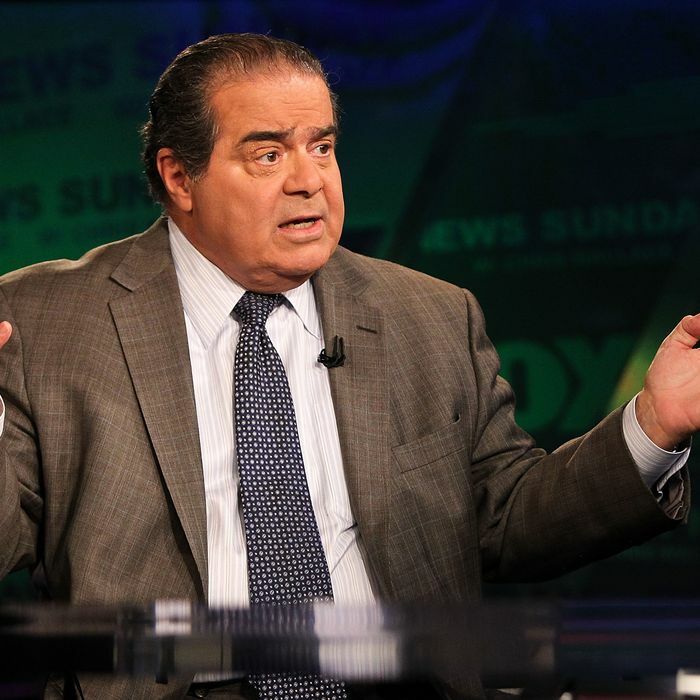 I think it’s strange.” – Antonin Scalia admitting he doesn’t have many Facebook friends.